Last night, I was ranting to a friend about the sorry state of Singapore’s entertainment industry. He asked me whether I thought I was in a position to change that. The first response that crossed my mind was “yes, I’m a little drop of water, but every drop of water makes the mighty ocean”. But as I thought further, my answer became “no”. I realised that my drop of water is, in effect, being rejected by the ocean. And if I’m not even in the ocean, how am I supposed to change anything? Kind of depressing, so I thought I should think about something happier, instead. Something I can do to make a difference. And that something is Project Postcard. 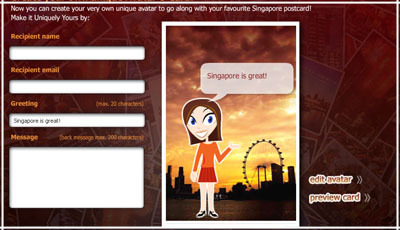 It’s the latest initiative by Singapore Tourism Board to promote tourism. You see, I think all Singaporeans should help promote tourism. Tourism helps our economy, which in turn helps us! So, to play my part and make a difference, I’m blogging about it! I want more foreigners to visit Singapore! More visitors means more happy retailers, which means increased advertising budgets, which means more modelling jobs for me! Haha! Speaking of which, here’s a bit of trivia: My very first modelling job was for a Haw Par Villa brochure, eons ago. Hahaha. I can’t stop laughing thinking about my early modelling days. Anyway, back to the topic at hand. Besides blogging about this, I’m also sending e-cards to my foreign friends. That’s a lot of difference I’m making, ok?! Of course, the fact that there are prizes up for grabs for both senders and recepients has nothing to do with it! Really! The process is quite fun, actually. 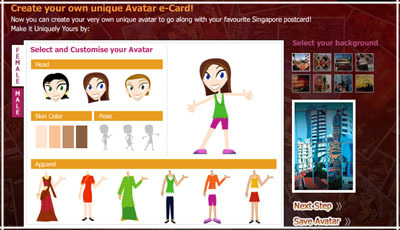 You get to select an avatar and dress it up (although the selection is a bit limited). 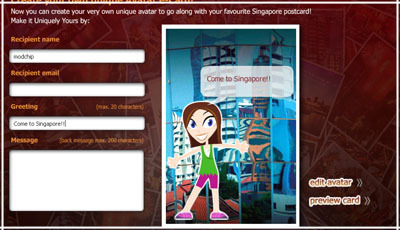 Then choose a postcard design and type a message! Here’s another one I made. And now, a special offer! I’m offering to send an e-card to anyone who wants one! Woohoo! That is, anyone who doesn’t live in Singapore. Otherwise, it wouldn’t make sense, would it? Just let me know you want one in the comments. And make sure the e-mail address you type is valid! Offer good till 30 November, 2007. I wonder where they found this pair of loving steps. So nice! Physical postcards can be found at Guardian, SingPost, McCafe, foreign clubs/schools/embassies, hotels and attractions, Singapore Visitor Centres and ZoCard free card racks. Well, I think it’s a great project. To find out more, zip over to the Project Postcard website! i wrote ‘i don’t have it yet’ on the pasport field..
IMO, tourism benefits more for the government and other high expense, exotic retailers or service industries. Many others may not fall directly into this hot sector. Unless your industry is lockstep to this economic sector, the increased tourism activity has a larger downside impact on the lives of the general population who are already struggling with the high inflation rate driven by foreign investors who may likely started out as tourists. Reality check on the recent property heat comes from these foreigners and indirectly causes increase in property taxes and therefore property cost and rental. Retailers have no choice but to transfer part of this cost to consumers like you and I. Unless you are generating more income for higher cashflow into your own pockets by either joining the crowd or other means, it is possible that the general trend may be heading towards what JB economically is today for the majority of our countrymen. Hi I feel that your this blog is much slower than last time leh. zield: You don’t have a passport?? Ng Wai Loong: Wow. Thanks for the info. I guess I don’t really know much about the big picture of economics. arachno: If you win, that means I will also win a spa and duck tour, so you don’t need to give me. Hehe. JokeDiary: What do you mean slower than last time? modchip: It depends on individual, I think. What you like doing and what you like seeing, stuff like that. Have been following your blog for a while now, started sort of as research from my big trip to Singapore (so it might be too late, I’m already convinced). But your blog is always interesting, so I keep coming back. Keep up the good work! Jesta: Hahaha. You are so cynical, my dear. 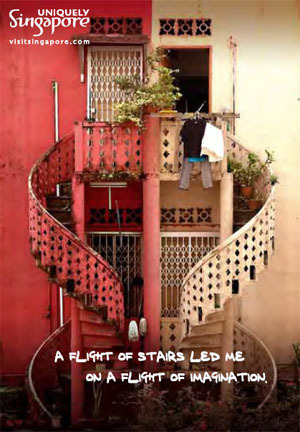 And I do think the postcard of the steps is the nicest one! I haven’t been there yet, being exchanged for educational purposes (spending spring at nus), so I’m coming in january. Can’t wait! erm.. as in take longer time to load. maybe it’s my line lol. Too many people sharing the same internet line in the office. modchip: You’re welcome! I hope you win too, heheh. smallapple: Er… I don’t think so. 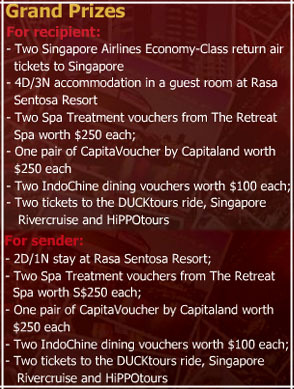 There’s only like two winners, I think, in the whole Singapore. arachno: Wah, cool! Thanks, hehe. tanyabeate: It’s my pleasure! Ohhh coool. I think exchange programs are so fun and exciting. I hope you enjoy Singapore when you get here! I would like some lady for chat Eng with me.